A rather large pair (52 inch waist) of Queen Victoria’s silk knickers, c.1890, have sold at auction for £6,200. The size of the underwear supports the theory that the Queen had become morbidly obese towards the end of her life. The knee-length bloomers were one of a number of lots to go the hammer at the sale at Westernhanger Auctioneers in the UK. A pair of silk stockings, also worn by the British monarch, sold for £1,100. The underwear was gifted to a member of her staff for their good service. They were passed down through the generations, and spent the last 75 years in a drawer. Some accounts claim Victoria had a waist measurement of up to 60 inches by the 1890s, and these bloomers certainly suggest a fair girth. 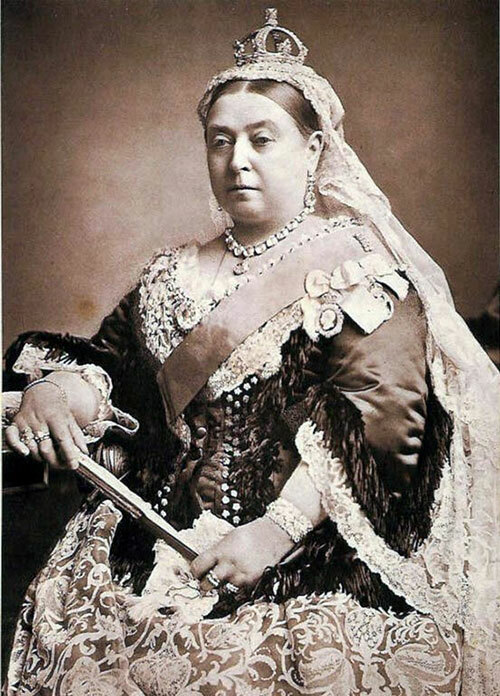 Queen Victoria famously gained weight after the sudden death of Prince Albert in 1861. Like other ladies of the late-Victorian era, the Queen wore open-crotch knickers whose separate legs were joined by a draw-string at the waist. Defenders of Queen Victoria claim the size of her waistline has been exaggerated, as a drawstring made knicker sizes variable. 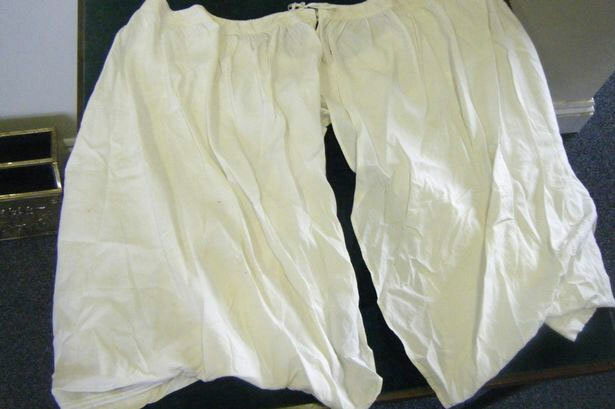 In 2013, a pair of linen bloomers worn by the Queen when she was at Balmoral in Scotland, in the late 1850s sold for £3,675. These knickers shed light on Queen Victoria’s younger slimmer days, revealing that the young monarch’s waistline was once 37 inches. In 2011, another pair of smaller sized bloomers worn by Queen Victoria in the 1860s sold at auction for £9,375. 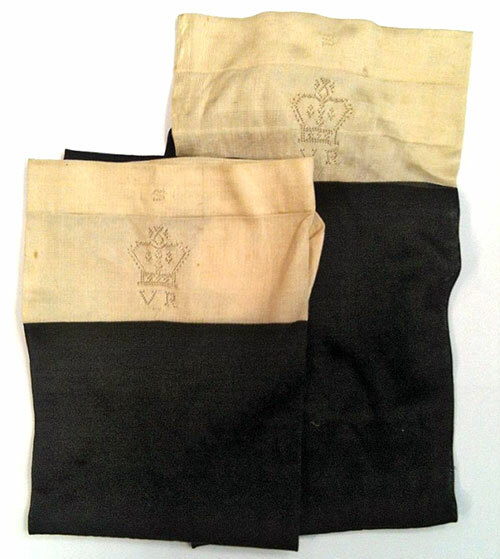 These 35 inch waist knickers were made from several yards of fine cream silk and embroidered with the letters VR – standing for Victoria Regina. Collecting Victorian royal memorabilia has been an enthusiastic pursuit of collectors for over a hundred years. The sheer length of Queen Victoria’s reign means that there is an eclectic range of commemorative items sought for by collectors, especially those marking her marriage and two jubilees. Due to her overwhelming popularity as a monarch, her subjects found abundant approaches to commemorate her, and of course, to make money. These collectibles include plates, cups and saucers, teapots, medals and coins, handkerchiefs and textiles, as well as prints and photographs. In 2013 this pair of black silk stockings belonging to Queen Victoria were sold for £1,800. The embroidered stockings featured a crown with the initials VR underneath for Victoria Regina as well as a small thistle to symbolize her love of Scotland. The most unusual and difficult to find royal souvenirs of this remarkable British monarch are her clothing items. At Queen Victoria’s death in 1901, there was a distribution of her huge wardrobe, including her underwear, to members of the Royal Household. These personal garments are now dispersed in both private and public collections. So why the enthusiasm for collecting Victoria’s undergarments? The Queen’s royal unmentionables, supplied by the Pryce Jones Company, are easily identified by her royal cypher, which was always worked on each piece. Perhaps this “stamp” of authenticity draws the collectors and inflates the sale price. What could be more proof of provenance than the royal crown and Queen Victoria’s Imperial Cypher, “VR” (Victoria Regina)? Examples of the queen’s undergarments have long been considered the crowning glory for Victorian collectors around the world. •In 2008, a pair of Queen Victoria’s bloomers with a 50 inch waist sold for £4,500 and a complete set of her undergarments were earmarked as a ‘national treasure’ and placed into the prestigious Royal Ceremonial Dress Collection, stored at Kensington Palace. •Linen split drawers (c.1890) embroidered with a crown and the initials VR, were sold at auction in June 2009 for £600 pounds to the Royal Ceremonial Dress Collection to eventually be displayed at Kensington Palace. These drawers measured 56 inches in diameter, a girth not surprising considering the Queen had nine children! •In 2010 a pair of her black and white silk stockings bearing the royal initials were sold by Lyon and Turnbull. This particular pair featured a design favored by the Queen during the 1870s which explained the advertised date of 1874. •Two pairs of silk stockings went under the hammer in Edinburgh in 2011 where they sold for a total of £9,735. New vintage clothing collections at Biltmore. Vibrant antique fabric samples help bring period fashion illustrations to life.